This Sat: Quexotic Adventures 5th Birthday Epic Extravaganza! This Saturday we’re celebrating FIVE YEARS (can you believe it?) 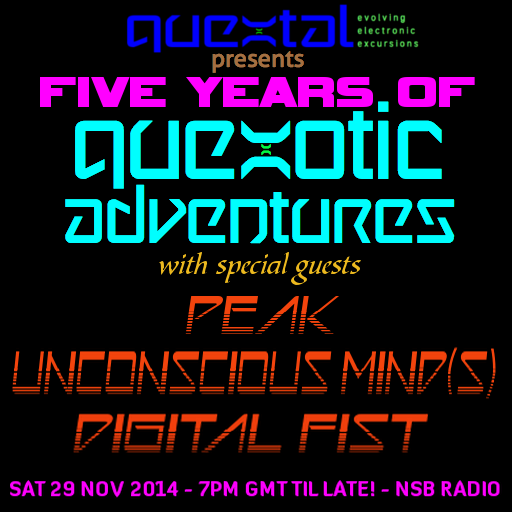 of Quexotic Adventures with a special extra-epic FOUR HOUR show featuring THREE of my favourite guests: PEAK, UNCONSCIOUS MIND(S) and DIGITAL FIST will all be joining the party live! You don’t want to miss it, so note these TWO things to remember: the time (7pm GMT), and the place, which is of course the number ONE breaks radio station in the world: NSB Radio!. Don’t forget to join us in the chatroom for cake and silliness!